A video of me laughing was shot for a competition organized by Nokia. The videoclips they shoot are rated by websurfers, AmIHotOrNot-style and the highest-rated clip will be used as a commercial for that phone. Good PR, i guess. What really matters is that currently i’m at number 1! Well, i did send an email to my friends telling them to rate me, but how far could that take me? 1337. 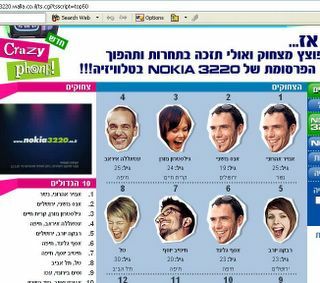 That’s not really me in the picture, it’s just an icon meaning that i’m a guy, but if you don’t read Hebrew, you’ll just have to believe me that it’s my name at number one. The new generation doesn’t care about the first amendment, and many even think that it’s wrong. This is oh so bad.